Get the Visit Our Lights Tag! 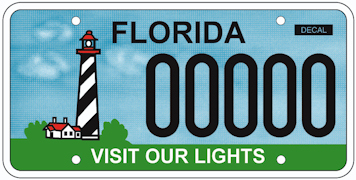 Proceeds from the sale of the Visit Our Lights license plates supports the mission and vision of The Florida Lighthouse Association. 90% of the $25 special fee ($22.50) goes directly to Protecting, Preserving and Restoring Florida's Lighthouses! Replace your old plate with a Visit Our Lights specialty plate at the normal renewal period, or within 90 days of your normal renewal date, by visiting your tax collector’s office. Find Locations HERE. Cost: First time cost to replace your old tag with a Visit Our Lights specialty plate is approximately $53. $25 of that goes to the Florida Lighthouse Association, $28 is a one time, State of Florida, plate exchange fee. Your regular registration fee also applies. After the initial cost, the annual renewal fee is only $25 more than your normal renewal fees. Keep you current personalized plate letters - visit your local Tax Collector's Office. Find Locations HERE. Check availability of personalized characters for your plate HERE. Fill out a printable Personalized License Plate form to take to your local Tax Collector's Office HERE. View Florida's gift certificate program HERE. Visit your local Tax Collector's Office. Find Locations HERE. Three options to renew your current Visit Our Lights Specialty license plate. Mail in your registration renewal notice form your local tax collector. These are usually mailed out six weeks prior to your birthday. Click HERE for Florida's convenient on-line renewal website.